There is a mysterious element to cats: a quality that is both fascinating and aesthetic, and can captivate the observer. As far back as ancient Egypt, the idiosyncratic, almost mystical, nature of felines was a source of wonder. And it was this sense of mystery that gave the Alacria WildCat its name. 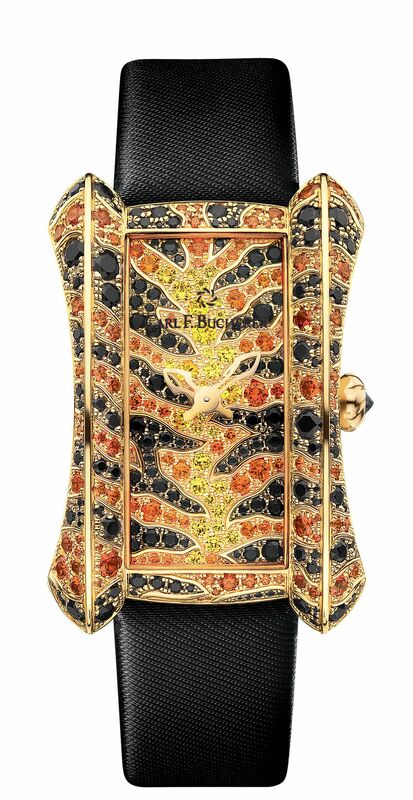 With its slender lines, curved yellow gold case and a striped pattern comprising red, black, yellow and orange-colored sapphires, it exudes a dynamic elegance that is, and will remain, unique, because a total of just 25 of these fabulous masterpieces of the watchmaker’s and jeweler’s art will leave the Carl F. Bucherer workshops. Each of the choice gemstones is selected and set by hand. The inspiration for the wave pattern and its colors came from the greatest of the world’s big cats, the tiger. The same feature that serves as camouflage in the jungle transforms the Alacria WildCat into a stunning eye-catcher and a piece that will sit perfectly on the wrist of any woman.